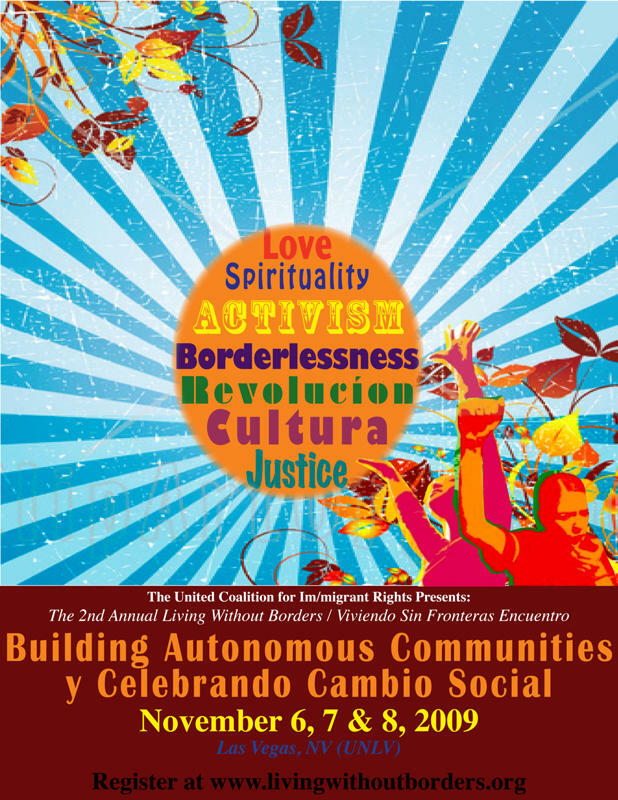 Living Without Borders encuentro * Nov 6-8, 2009 * Las Vegas, Nevada * Pass it on! The 2nd annual Living Without Borders encuentro will be held from Friday, November 6 to Sunday, November 8, 2009, in Las Vegas, Nevada, on the campus of University of Nevada, Las Vegas. Workshops, presentations, film showings, tabling by community artists and organizations, and conversation. 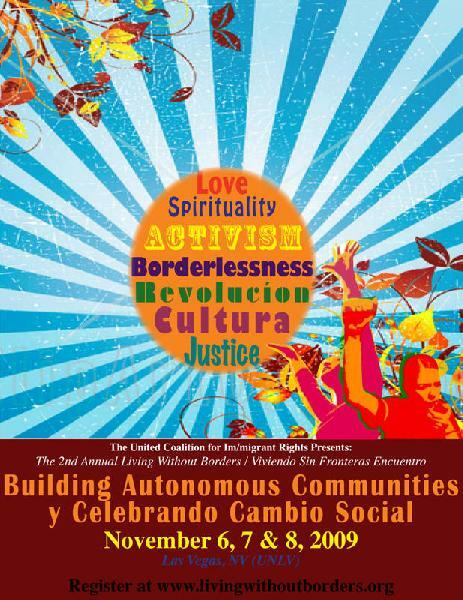 * Keynotes by RINKU SEN (author, The Accidental American) and HILDA GARCIA (from La Mujer Obrera autonomous women's community in El Paso, Texas). * A free show with Pan de Sal, Fe with Rebel Diaz, Paria B, EarthStone, and DUWOPRose The Vinylist. * Free breakfast and lunch will be provided for those who register in advance. All are welcome! *** listservs, or web pages that might be interested in the event! WHAT IS LIVING WITHOUT BORDERS? on the campus of University of Nevada, Las Vegas. consciousness, organize campaigns, and have fun as a community. community in El Paso, Texas (<http://www.mujerobrera.org/>). their own workshops about issues and projects that matter to them. immigration freedom, anti-racism, queer liberation, and feminism. awaken, inspire, and reinvigorate the activist within each of us.